Last year I went riding with my brother-in-law. He had just gotten a used KLR that shook some very important bolts free. He felt a dangerous wobble and pulled over. Fortunately I had my handy-dandy tool kit with me, otherwise he would have been doing a lot of pushing. A single loose bolt can stop you from riding, and how embarrassing would it be to have to shove your machine a mile or two because you didn't have a wrench? Lesson learned: he now has quite the impressive tool kit. 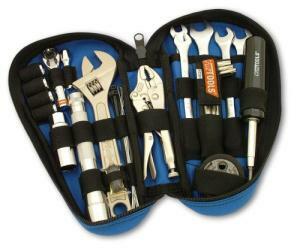 CruzTools' Teardrop H-D tool kit has a selection of wrenches, tape, a flashlight, pliers, screwdrivers, etc. There is even a neat little mini ratchet and socket set, a tool that isn't found in many kits and can come in very handy. The kit itself is designed to fit a teardrop toolbox, but it will also reside happily in saddlebags or shoved in the front of your coat in a pinch. The flexible pouch helps protect your tools and keeps them organized for fast access on the roadside. The advice about tools I've always been given, and from some reputable sources with a lot of miles under their wheels, is: If you use it to work on your bike, put it in your kit. This might not be possible for big things like scissor jacks, but you get the idea. Now, I would be a little surprised if you needed to buy a kit at all, because riders probably already have everything they need. You could probably find a box and build your own kit cheaper, but having a dedicated set will make it less likely you'll take out your screwdriver and forget to put it back. If you already have the tools and just need the bag, Xelement makes an attractive (and waterproof) tool bag.